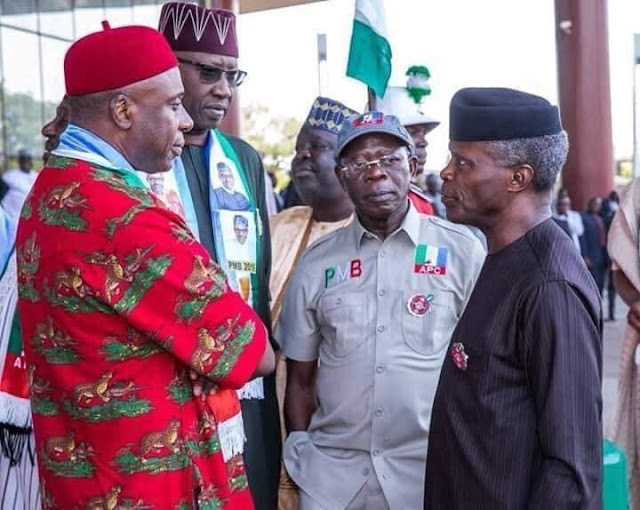 The Vice President, Yemi Osinbajo, on Tuesday reacted to the violence that rocked the All Progressives Congress (APC) campaign rally held in Ogun State on Monday. Mr Osinbajo said any member of the APC working against the success of the party in the forthcoming general elections is like ”a bad cutlass with one (sharp) edge”. Mr Osinbajo stated this during a town hall meeting held at the palace of the traditional ruler of Ago Iwoye, Abdulrazak Adenugba, in the course of his campaign tour to the state. A campaign rally organised by the APC for President Muhammadu Buhari in the state on Monday turned violent when thugs hurled stones and sachet water in the direction of seated dignitaries. Security operatives scurried frantically to prevent Mr Buhari from being hit. Governor Ibikunle Amosun, an ally of President Buhari, has been having a running battle with the party chairman, Adams Oshiomhole, over who flies the party’s governorship flag in the forthcoming polls. The crisis got worse after Mr Amosun’s favourite to be his successor lost out in the politics of the APC primaries. The governor blamed Mr Oshiomhole, ex-Lagos governor Bola Tinubu and ex-Ogun governor, Segun Osoba, for his ordeal. He then vowed to work against Dapo Abiodun, who is now the APC governorship candidate for next year’s election and has the backing of Messrs Tinubu and Osoba. Since then, the Oshiomhole-led National Working Committee has dissolved the Ogun executives of the APC and announced a caretaker committee headed by Yemi Sanusi. Ayobami Olubori was announced as secretary and Tunde Oladunjoye publicity secretary of the committee. Mr Osinbajo, who was also at the rally on Monday, said despite the incident, the electorate should vote massively for the party and its candidates. The official said the APC, is the only party that has the capacity to improve the lives of the people. ”Vote for APC alone in all the elective offices because we don’t know of those who are meddling or promoting another party. Anyone caught in such an act can be described as ‘bad cutlasses’. Mr Osinbajo also said, “Vote for APC alone in all the elective offices, remember that a cutlass should have only one sharp edge. Anything short of that makes such cutlass a bad one. “You need to vote for APC because even the most hardened enemy of President Muhammadu Buhari knows that he is not a thief nor is he corrupt. And secondly, you have to vote for us because of the many things that we have in stock for you.